We live in a fascinating (automotive) world. Cars transport passengers and goods across the country, take us to the local supermarket, to the neighborhood kindergarten, downtown to the office or to other countries on vacation. They make us faster, more efficient, and more independent. Driving is affordable, comfortable and convenient, and great fun. has risen from around 1,000 kilometers in 1950 to some 12,000 today. Academics call the need for almost boundless mobility a significant social reflex in evolutionary terms. Because only those for whom distance is no obstacle are in a position to find security, nutrition or simply better living conditions. According to figures from the German Federal Motor Transport Authority, some 44 million vehicles are out and about on Germany’s roads. In statistical terms, there are 1.1 cars for every one of the 40 million or so households in the country. 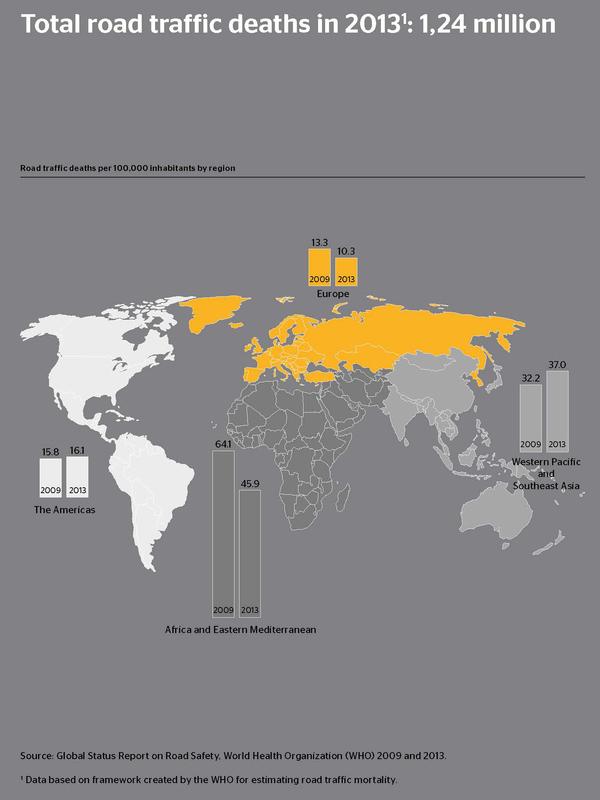 Few nations in the world have more vehicles per 1,000 inhabitants. But there are downsides to this mobility. According to NHTSA, in 2010 the total economic cost of motor vehicle crashes in the United States was $242 billion. And not a day goes by without someone being seriously injured or even killed on the roads. The Federal Office of Statistics has been monitoring this disastrous aspect since 1953. Since then, almost 750,000 people have lost their lives in road accidents in Germany, a figure higher than the population of Frankfurt/Main. Even now, with road traffic deaths reaching an all-time low of 3,339 in 2013 (in 2014 there were 3,377) every day an average of ten people are killed on the roads in Germany.